One of Takashi Murakami’s signature works, Inochi was shown to the public for the first time in LA in 2004, and followed with a tour through Europe. The sculpture was inspired by Stanley Kubrick’s original designs for the movie A.I., and is based on the motif of the robot child, asking questions of its viewers like: “What is the future of human beauty? In a nation like Japan that exceeds in building robots, what features define the human form?” Over 6 years in the making, this extraordinary sculpture represents the combined efforts of several talented individuals; in all, as many as 70 craftsmen took part in its production. This new exhibition of the work at the Kaikai Kiki gallery in Tokyo is being held to commemorate the release of a line of action figures which recreate the sculpture with great precision. In addition to the sculpture itself, the exhibition will include Project Inochi, a series of artworks from other mediums, including film, that aim to elaborate on the mythology and surrounding universe of the title character. Come witness this work, the product of uncompromising passion from one of the world’s top artists. 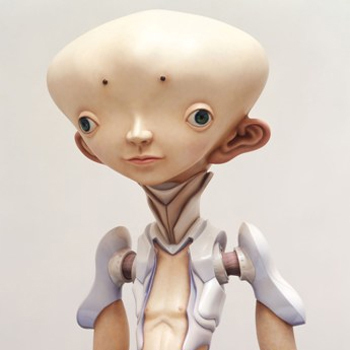 Among the many collaborators featured in this project are the uniquely gifted robot designer Eisaku Kito, known for his work on the movie Innocence, and long time Murakami collaborators Lucky Wide who provided the 1/1 mold. There’s also Donju director Hideaki Hosono who teamed with Shingata, one of Japan’s leading advertising firms, to make an Inochi short film. Lastly, photography for the posters was done by cutting edge photographers Mikiya Takimoto and Miwa Tosaki. Fashioned with an astounding attention to detail by MEDICOM TOY, one of the world’s top producers of action figures, the Inochi figure is a small-scale replica of the original sculpture. Just as its larger counterpart was subject to over six years of work before reaching completion, the action figure has been in planning for nearly three years. The results showcase a level of perfection that exceed that of a mere toy and accord it the status of a work of art. The action figure also comes with costuming, in the form of Inochi’s school uniform and book bag, both of which are removable. The figures will come in 5 colors, identical to those worn by the original, and will also be available as a special set of 5. Every figure is a limited edition work, with 200 items produced of each color, and a smaller edition of 25 for the five piece sets. All will, of course, be personally signed by Takashi Murakami. A limited number of the figures will be available for sale during the exhibition . Further information on when and where purchases can be made will be published on our official website (www.kaikaikiki.co.jp).